8x8 Virtual Meeting Google Calendar Plugin | 8x8, Inc. Schedule 8x8 Virtual Office Meetings from Google Calendar. 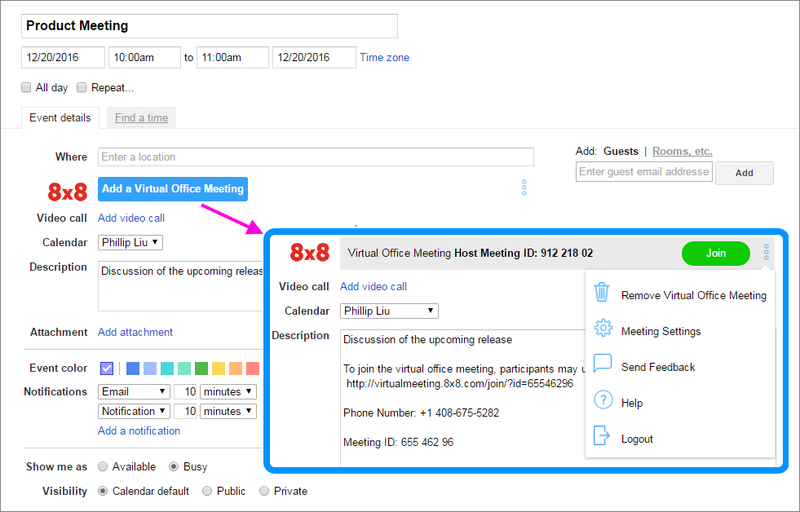 The 8x8 Google Integration links your Google calendar to Virtual Office Meetings. See your contacts’ availability and schedule Virtual Meetings directly in your calendar. Join meetings from the calendar pop-up. Check co-worker availability and schedule a Virtual Office Meeting from within Google Calendar. View and join the Virtual Office Meetings you’re hosting or invited to from Google Calendar. Requires an 8x8 Virtual Office Pro or Virtual Office Meetings standalone user account.